The Greys GR60 has been a greatly anticipated release for the angling community following the overwhelming success of the GR50. The new GR60 series is an extensive range of modern high-performance fly rods that are the first to utilise Grey's new cutting edge Toreon nano blank technology. These blanks are seriously ahead of the game being lighter and stronger than standard carbon fibre blanks, pushing feel and performance to levels that couldn't before be achieved. They come in a stunning black satin finish for a deluxe feel and appearance meeting the standards we have grown to expect from Greys. The blanks feature line up indicators printed onto them for quick and hassle-free assembly. The rods feature a two-tone aluminium reel seat with a carbon spacer to keep your reel securely in place and prevent it from damaging the cork when secured tightly. The handles are made out of premium AAA grade cork with a smooth and delicate grip for true and precise casts and include composite tipping for increased rigidity and further protection. The rods themselves have a 4 piece construction allowing them to be packed down and stored safely. They come supplied in a soft cloth rod bag and a hard protective rod tube with a screw cap. 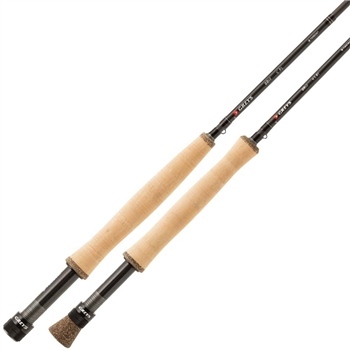 The Greys GR60 Fly Rod is available in a wide selection of models that you can choose from using our drop-down menu. Take your time to choose the model that best suits your fishing situation and let the rod do the rest.